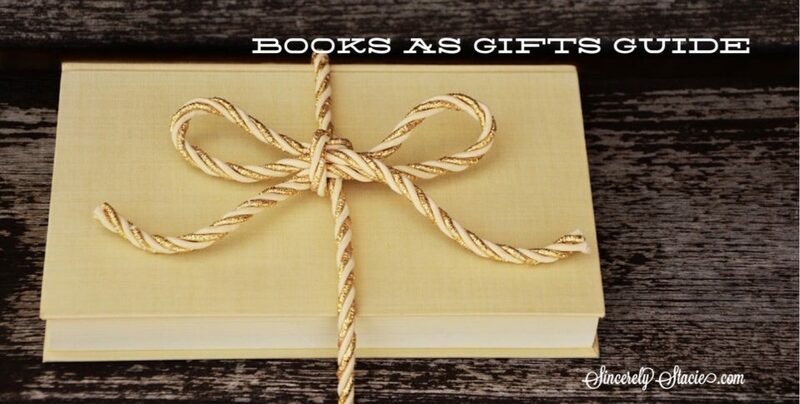 Books make the best gifts. I may be a little biased, but I love giving books as gifts. I think they offer a personal connection. You are either saying, I loved this book and I think you will too. Or, I know you love cats, science, history, etc so I thought this would be a great book for you. It means you have listened to them when they have shared something with you and that you took the time to notice. To see all the posts in this series, click HERE. When Santa wakes up sick on Christmas Eve morning, everyone at Santa’s Workshop and the North Pole is worried that Christmas will have to be canceled. But, not as long as Mrs. Claus is around. She can handle whatever it is that Santa does. 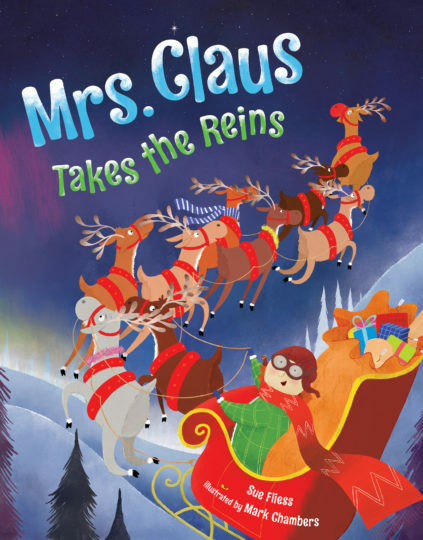 With everyone in shock, Mrs. Claus says she will deliver the gifts all over the world on Christmas Eve. 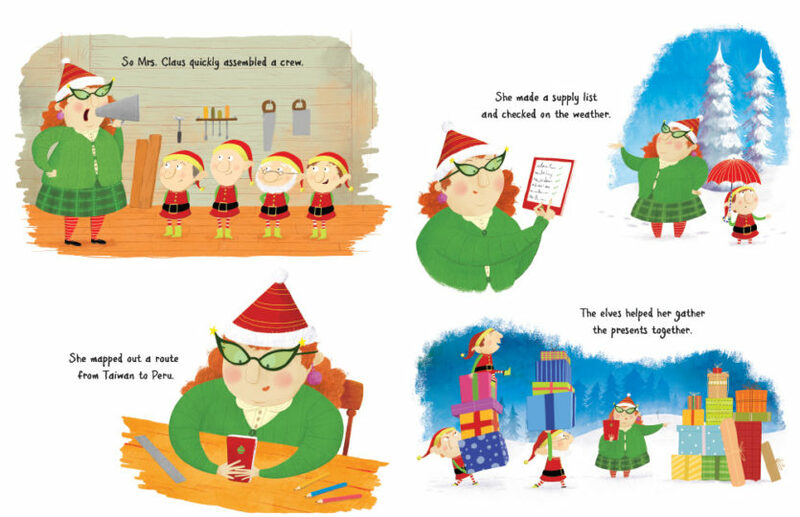 Mrs. Claus assembles her crew, uses her smartphone to map her route, checks her list and the weather, packs some snacks (like any responsible mom would) and away she goes with her travel cup of coffee in hand. While going house to house, leaving gifts behind she is relishing in the joy of delivering Christmas to all the girls and boys. But, it wasn’t without some mishaps including bad weather, a leaky gas tank, a near head-on collision with a duck, and some tangled reins. But, just like Santa, Mrs. Claus pulled it off, visiting every house just in time. Oh my gosh, I giggled my way through this book, mostly because of the illustrations. The first thing I noticed was Mrs. Claus’ curly, red hair. I knew right then I’d be passing this book on to my two red-haired nieces. It’s not a usual hair color choice for book characters. I loved how the artist chose to make Mrs. Claus modern with her smartphone and “Starbucks” like coffee to go. She took care in arranging the gifts under the tree and came up with quick fixes to some of the mishaps. Mrs. Claus truly saved the day and when Santa tries to thank her with a cup of hot cocoa, he is instead met with some very sleepy reindeer and a cashed out Mrs. Claus. This is such a fun read with rhyming text and bright illustrations, kids will want to read it again and again. It’s one that is sure to become a classic in your Christmas book library. Sue Fliess is the author of more than twenty children’s books, including Shoes for Me!, A Dress for Me!, and Books for Me!, all illustrated by Mike Laughead; and Let’s Build, illustrated by Miki Sakamoto. Sue loves the holiday season and hopes she made it onto Santa’s “nice” list this year! She lives with her family and their dog in Northern Virginia. Learn more about Sue online at www.suefliess.com. You can find all of Sue Fliess’s books, HERE. Mark Chambers is an award-winning author and illustrator of more than thirty-five children’s books. In 2013, Mark won the Sheffield Children’s Picture Book Award and was short-listed for the Roald Dahl Funny Prize. In 2017, his artwork entitled “We Will Remember” was short-listed for the AOI World Illustration Awards. Mark lives and works in the United Kingdom and once spent Christmas in the Arctic Circle. Learn more about Mark online at www.markachambers.com. 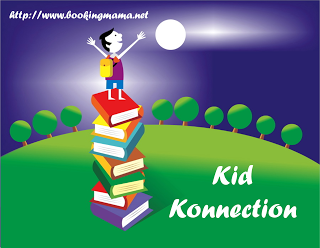 I previously reviewed another book that Mark Chambers illustrated, YOGA FROG, and loved it. Thanks to the publisher for providing a copy of this books for the purpose of this review. This review is my honest opinion. If you choose to purchase this book through the above link, I may receive a small commission without you having to pay a cent more for your purchase. Mrs. Claus used to send gifts for my sister and me when I was growing up. I wish this book had been around when my son was young.